Do forgive me if this review is a little rubbish, haven't done anything for a while. Melt into a bath of sugar sweetness. This festive Luxury Bath Melt smells just like our best-selling Snow Fairy. As it melts in the hot water, the shea and cocoa butters create a skin softening blend, while the icing sugar makes the water creamy and soothing. It's the icing on the cake for all snow fairies and mortals who seek fairy magic and lovely pink water. It's Christmaaaaas. Oh god. :| I said the c word. I know, I know, no one wants to even think about that yet but Lush have recently released their Christmas range and I checked it out in store yesterday. Please excuse the glitter (From my Flosty Gritter) and the random blue stuff, I don't know where that came from. And also the fact that this isn't orange. It is infact pink but the flash wouldn't pick anything up besides over exposed whiteness (helpful) so I had to use the artifical bathroom lighting. But yes. If you didn't know the main ingredient in this is icing sugar. Would you believe it?! It also contains cocoa butter, cold pressed organic starflower oil and shea butter. And it has that wonderful Snow Fairy scent. If you're not a fan of sweet things then this really isn't for you. I had pink water that smelt of sweeties. :D I forgot to mention this is my first ever Lush bath and what an amazing one it was that. I really didn't want to get out until I was that wrinkly I figured I had to at some point. :( Can't comment on the scent lasting as I put something on afterwards that is scented so I can smell that. 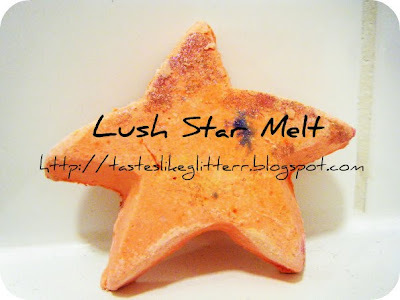 But I really do love this and if you like sweet smelling bath products I urge you to try this. I'm not sure if this is limited edition so try it while you still can.